I'm certain many of our clients and their trades continually hear my team and I hammer about records, records, records on construction sites (pertaining to dust control). As annoying as that is...we have a purpose I promise. The snap shot below from Maricopa County Air Quality will explain why. These violation numbers were pulled in June of 2015 for the first half of 2015 alone. As you can see, dust control records (water log) violations are common and easily avoided. Example: All trades that are on site should have a water source and should be keeping records - daily. Who manages this process? Earthworks! With the help of each builder (client) we can manage each site to be sure all trades have a water source on site and are keeping accurate and up to date records. Our new DPPP (Dust Pollution Prevention Plan) binders that are kept on site help with this process. We are verifying each week that all trades keep records and they are on-site and available for review. 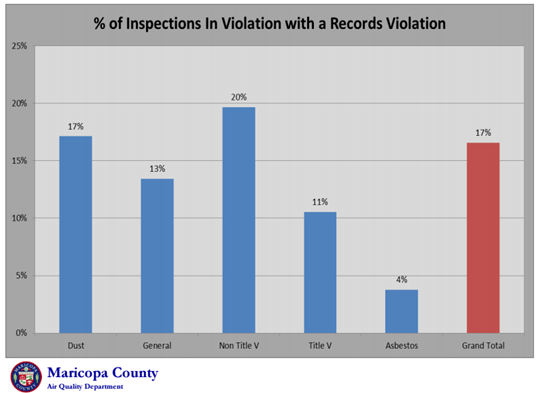 Inspectors do allow 48 hours to receive and review records - as I tell the guys in the field - this does not mean you have 48 hours to create 4 weeks of records. (Can't fool me...I'm a mom!) I know this happens and we can help you avoid this.